Your keyboard is boring—it doesn't do anything special or unique. 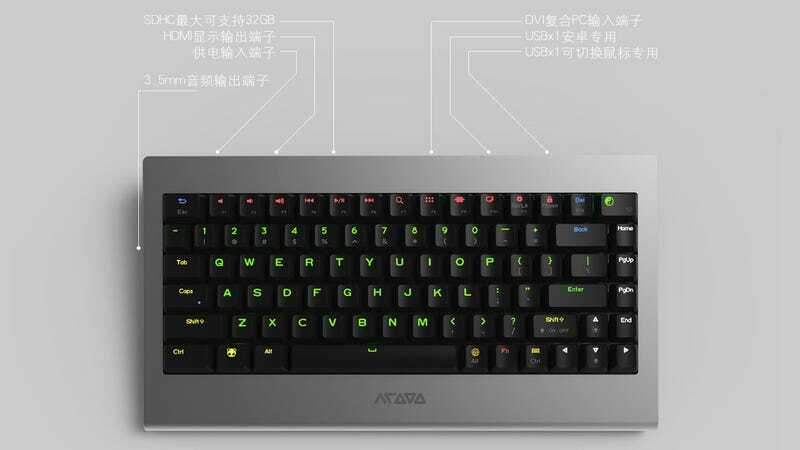 You could change that: some crazy bastards in China have built a keyboard that's secretly a quad-core Android PC. This thing is like a supercharged version of the Commodore 64: a keyboard with a power cable, USB plugs and an HDMI port. Plop it down in front of a computer monitor or TV and bam, you've got full-blown Android machine. It's called the OneBoard Pro+ and, according to Google Translate, it hails from the "Bejing-Cool Computer Co." If that's not really the company's name, I don't want to know. The idea itself is awesome, but the build quality makes it even better. This isn't some cheap, mass-produced budget product, it's a good-looking mechanical keyboard with an aluminum chassis, individually backlit RGB key-caps and Cherry MX switches. Nice.